I have had this recipe since I was 7 or 8 years old. 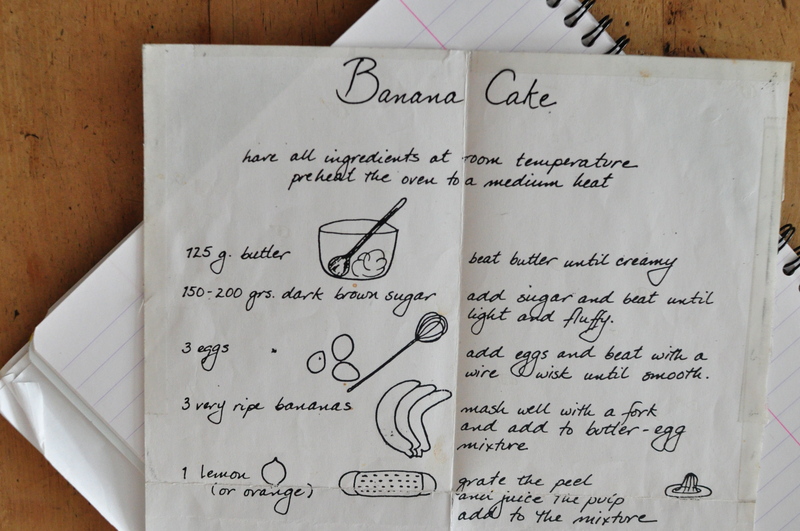 I must have been in second or third grade; a friend in my class brought a banana cake to school to celebrate his birthday and offered photocopies of the recipe. I kept the photocopy, and it appears that I have collected recipes ever since. Not obsessively or excessively, but, every once in a while, I wrote down a recipe I liked. Some years ago I copied these recipes into an orange, cloth-bound dummy book (a sample with blank pages) on the architect R.M. Schindler that I was editing at the time. The recipes compiled in the “Schindler book” (as I now very personally refer to it) are not anonymous, they are not newspaper clippings I fell across and found enticing – they are all linked to memories, and people. 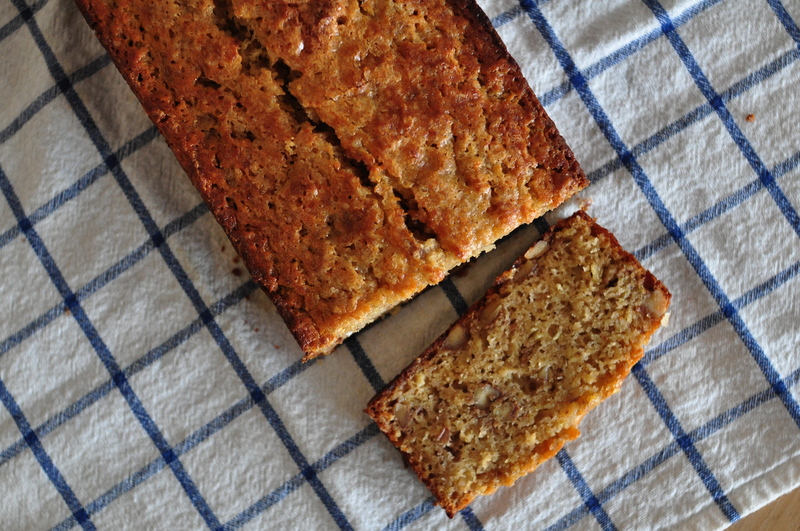 This banana cake reminds me of my first school in France, of Jacob (my school friend) and his family with whom we have not completely lost touch; it evokes their music and a lemon tree in their San Francisco garden that I have seen only in photographs. Also, it is a very good banana cake. 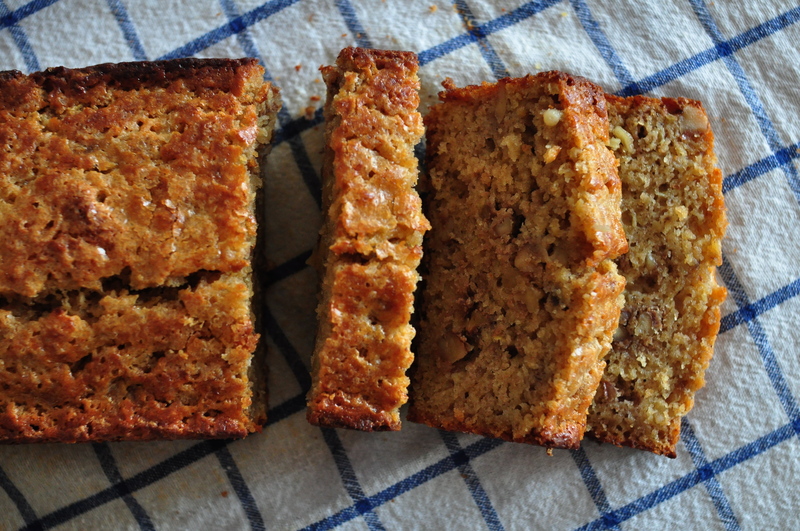 I resisted tweaking the recipe except for the walnuts, as I seem unable to refrain from putting nuts in a cake. In a large bowl, beat butter until creamy. Add sugar and beat until light and fluffy. Add eggs and beat with a wire whisk until smooth. Mash bananas well with a fork and add to butter/egg mixture. Grate zest and juice the lemon (or orange) and add to batter with the vanilla extract. Mix well. Mix together flour, baking powder, and salt in a small bowl and add to batter. Stir gently, just enough to blend everything together. Gently stir in walnuts, if using. Line baking pan with parchment paper, butter the paper, and pour in the batter.